I am providing my own work here under an Attribution-NonCommercial-ShareAlike Creative Commons License. Yangguan Pass Song (阳关三叠 or "Three Variations of the Parting of the Friends at the Yangguan Pass"). This is a famous Chinese piece of music which I transcribed for solo guitar and plucked string orchestra. Originally the music was written for guqin (zither). My version is modern, but tries to maintain the Chinese pentatonic style. An electronic rendering of the sound is provided below (unfortunately Musescore does not have a mandolin tremolo sound). If you play this piece, I'd love to hear about it! Provided under an Attribution-NonCommercial-ShareAlike Creative Commons License. The works here should be in the public domain because their composers died more than 70 years ago and the publication was more than 50 years ago. My reason for posting these here is because it is basically impossible to find them anywhere else. If any of these are actually still copyrighted, please let me know and I will remove them. Haydn's Andante from the Surprise Symphony (parts) arranged by Henze. Tekla Badarzewska's Maiden's Prayer (parts) arranged by Henze. Beethoven's "Die Himmel rühmen" (score) arranged by Kollmaneck. 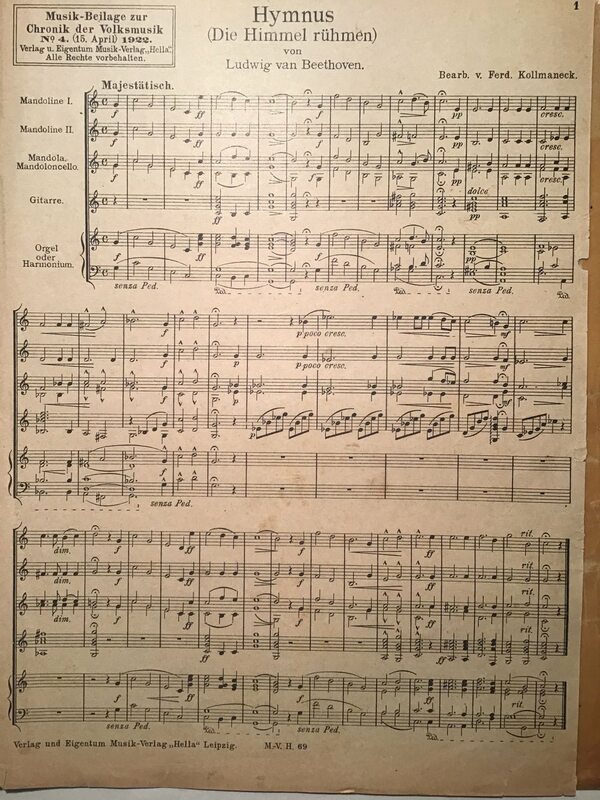 Haydn's Menuett from the symphony in D major (score) arranged by Kollmaneck. Further works by Kollmaneck are available here. Other works by Sartori are available here. Fantasy over Verdi's Rigoletto (parts) arranged by Schick. Fantasy over Verdi's Troubadour (parts) arranged by Schick. Ouverture of Weber's Oberon (parts) arranged by Schick. Martinez's Auf hohem Meere (parts) arranged by Schick. Meyerbeer's March (parts) arranged by Schick. Meyer-Helmund's Ballgeflüster (parts) arranged by Schick. Fantasy over Rossini's La gazza ladra (parts) arranged by Schick.